The MegaPulse DF-80PF DSW Surge Tester is designed to conduct the test shown in AAMI DF80, App. DD, Table US.DD.1 and Figure US.DD.1 - Damped sinusoidal waveform parameters. The resulting waveform is in accordance with those requirements. For waveform and tolerance/compliance graphs and information, click here. The DF-80PF DSW is built with 50 ohms output impedance. If another impedance is desired, please contact us. Option 60. Allows one test every 60 sec continuously. Option 12. Allows one test every 12 sec continuously. The power output of the DF-80PF DSW is 360J. A front panel switch reverses the output polarity. Positive and negative pulses can be delivered manually using the front panel buttons, or the pulses can be set to operate under computer control using the TestMinder Megapulse PF option. Actual output waveforms are available for review in the Manuals section below. MegaPulse DF-80PF DSW ships with cables, graphs of theoretical and actual waveforms, and a Calibration Certificate. One-year warranty. Generates the waveform required by AAMI DF 80 App. 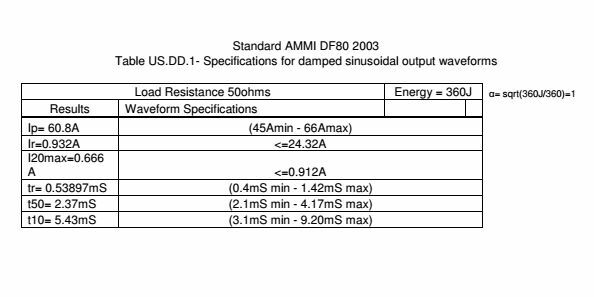 DD, Specifications for damped sinusoidal output waveforms. Theoretical graphs and actual graphs showing the output of your tester are included with each MegaPulse Defib Surge, allowing easy sanity checks and proof to visiting agency engineers of test setups. 360J output; 50 ohms impedance standard. Duty Cycle One pulse per minute. Faster duty cycles optional. Joules display On front panel, after every pulse. Available by pressing the Energy Measurement Button. Joules Output Displayed on the front panel after each test. TestMinder PF USB Control optional.